I didn't see an appropriate place for enemy skin sheets, so if I missed it let me know! Map and level themes to accompany these are on the way. CowboyJoseph64, Omicron, French rocks and 6 others like this. Oh you changed the Dinosaur (or something) for some single-eyed blue monster? Cool stuff! I'm not playing, but I can FEEL how gloomy this Kingdom is. I *can't* be the only one who's a little genuinely scared by those. Anyways; I might be along sometime with a Mega Man-based enemy set. No, you're not the only one. They creep me out too. The goombas are my favorite. Love this! They're almost Lovecraftian in nature! I made a Banjo Kazooie enemies skin. It's in my Banjo Kazooie Project thread for those of you interested. It's about the fourth post. I'm looking forward to seeing more original stuff along with enemies from other games. ChozoBoy, TheomanZero, uglyrodent and 2 others like this. 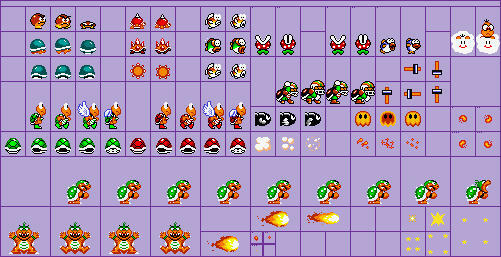 Is it just me or does the fireball in the original 8bit sprite sheet thing for Bowser look like it's traveling backwards? → I think we've all been wondering about that. I think you should make chargin chuck throw footballs like in smw and then it's perfect. Edit: I think I'd also personally prefer the skinny main koopaling (I think it was either iggy or lemmy), but Morton works well enough. Thunder Wing and Mitewing like this. Hows this for a kid icarus skin? Edit if you want to. While I do think you should use as many enemy sprites from the game as possible before making your own custom sprites, I do at least have to admit that the custom sprites look kinda cool lol. But like I said, there's plenty of Kid Icarus Enemies that you probably don't need to make that many custom sprites. Some custom sprites are ok, but I don't think you should recolor Mario enemy sprites. Try to represent as many kid Icarus enemies as possible before you repeat them or recolor Mario ones. On another note, functionally, the grim reaper guy that summons those flying things would be kind of cool as lakitu, and he could throw those enemies he summons at you. Good idea for Chargin Chuck throwing footballs! And for the koopaling, I chose Morton mainly because he's completely green like NES Bowser, and Lemmy doesn't have a full body standing sprite for SMW, and Larry and Iggy don't have the open mouth sprite for spitting fire. I used the Grim Reaper as Bowser since there are not enough medusa sprites and im going to replace the recolors with other enemies. EDIT: I've improved it and replaced the recolors. Hm..... what are these palettes from? I mean, which console was that game from? By the way, there are some lonely pixels floating around the boss. Are they here on purpose? Were there not Hammer Bros in SMW? Not normal ones, no. I think the closest were the ones who flew around on blocks throwing hammers down.